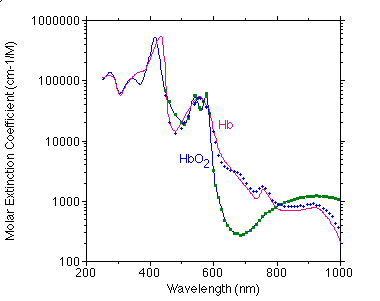 One of the most confusing things about looking at hemoglobin (Hb) spectra is that the values are typically tabulated in equivalents. The term equivalent is used to indicate the amount of hemoglobin which contains 1 gm atom of Fe and combines with 1 gm molecule of O2 or CO. One equivalent of hemoglobin is assumed to be 64,500/4 or 16,125 gm. A concentration of 10-6 equivalent is 16.125mg of hemoglobin per cc. Thus there are four times as many equivalents as there are hemoglobin molecules. 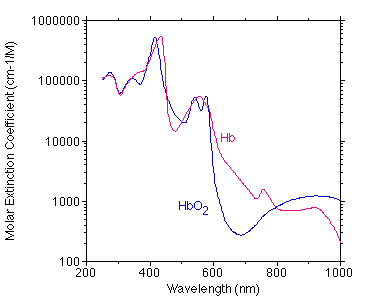 If the hemoglobin molecule is bound to oxygen then one has oxy-hemoglobin or Hb02. If the hemoglobin molecule is bound to carbon monoxide then one has carboxy-hemoglobin or HbCO. 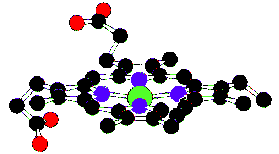 If the hemoglobin molecule is bound to nothing then one has deoxy-hemoglobin or Hb. 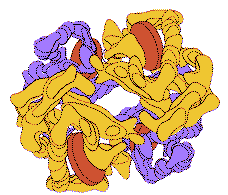 If the hemoglobin molecule has broken down then one has met-hemoglobin. 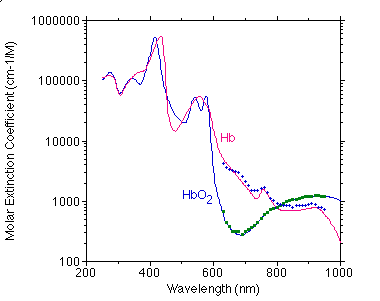 These all have different spectra. Below is a comparison of Moaveni's data (points) with my compiled values (curve). Below is a comparison of Takatani's data (points) with my compiled values (curve). Hemoglobin has a normal concentration of 150g/liter of blood permits whole blood to carry 65 times more oxygen than does plasma at a PO2 of 100 mmHG. Hematocrit determines the fraction of the blood that is red blood cells. The red blood cells are primarily composed of hemoglobin (95% of the dry mass). (150g Hb/liter)(1.34ml O2 g Hb) = 200ml O2/liter. where μa is in (cm-1) and e(lambda) is the molar extinction coefficient for the wavelength of interest.